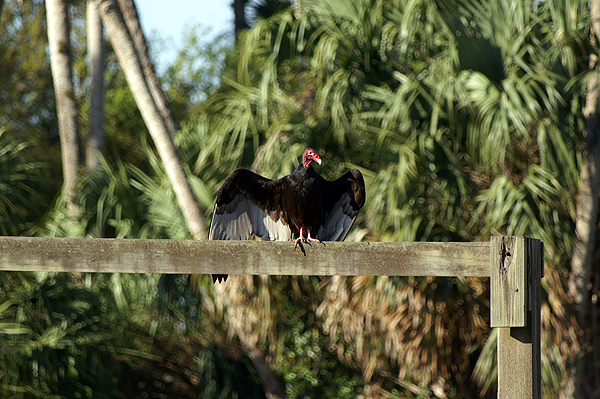 This turkey vulture is soaking up the sun on a cool morning. The name turkey vulture comes from their red head, which is similar to that of a turkey. These vultures have an excellent sense of smell that allows them to home in on rotting carcasses. This entry was posted on Friday, June 1st, 2012 at 2:00 pm. It is filed under Animals / Wildlife, Collections and tagged with bird, carrion feeder, Cathartes aura, roosting, sunning, turkey vulture, vulture. You can follow any responses to this entry through the RSS 2.0 feed.